As The Wind Blows: Move over Wisconsin...Alabama has the cheese! Alabama has a decedent and creamy secret they are ready to share... For 25 years they have been the home of some amazing Goat cheese! In Elkmont, AL the Belle Chèvre creamery has been supplying the country with their extrodianary spreads in stores like Macys & Whole Foods with not many realizing it's made here in Alabama. Well the secret is out and Huntsville was the first stop in an amazing tour to put the cheese on the cracker. Huntsville's Mayor, Tommy Battle was in attendance to wish Huntsville's own Tasia Malaskasis and the Belle Chévre crew a successful and safe trip as they traveled the country on a tour with Whole Foods in a custom Airstream trailer. Downtown Huntsville Inc. was a great hosts as those in attendance got a chance to sample delicious cheese cake made with Clinton Row's newest occupant. 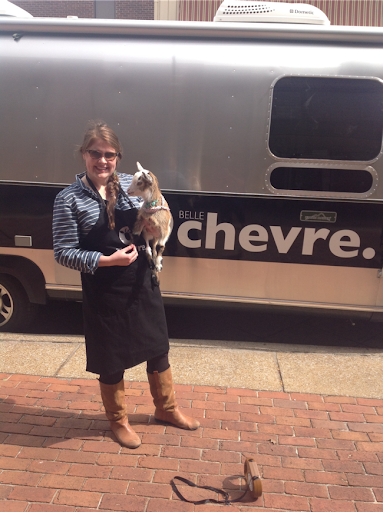 The Belle Chèvre crew and the cute baby goat, Valentine will share their adventures on a website, Belle's Big Big Adventure, that offers an interactive look at their travels. My mother, Ms Josie, joined me to sample the cheese and we were both pleasantly surprised. I can't wait for the grand opening of the flag ship store in Huntsville later in April. So move over Wisconsin, Alabama is bringing the cheese! Are you a fan of Goat Cheese? Did you know Belle Chèvre was here?